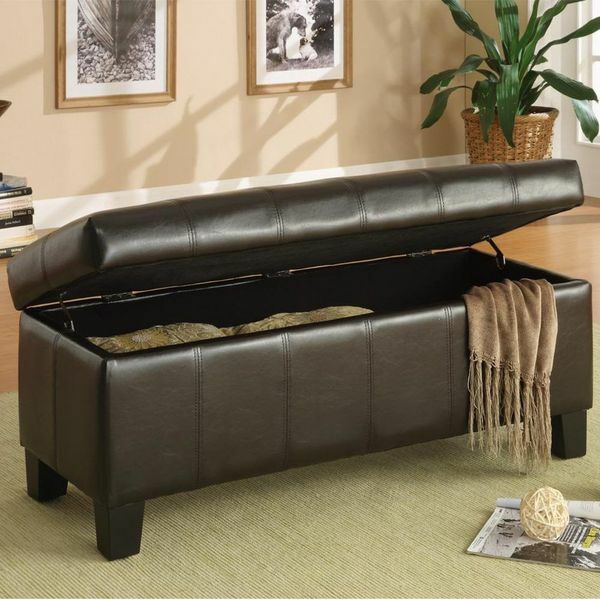 Here is a dark brown contemporary square faux leather storage ottoman from Coaster Home Furnishings. This is a nice leather storage ottoman with beautifully finished wood legs. It has a very contemporary design and provides you with plenty of storage space to help you stay organized. Store your shoes, hats, coats, dogs, candy, hidden treasures, or pretty much anything you can think of! Coaster Home Furnishings is a very well known company and you can rest assured that anything you buy from them will be of very high quality. 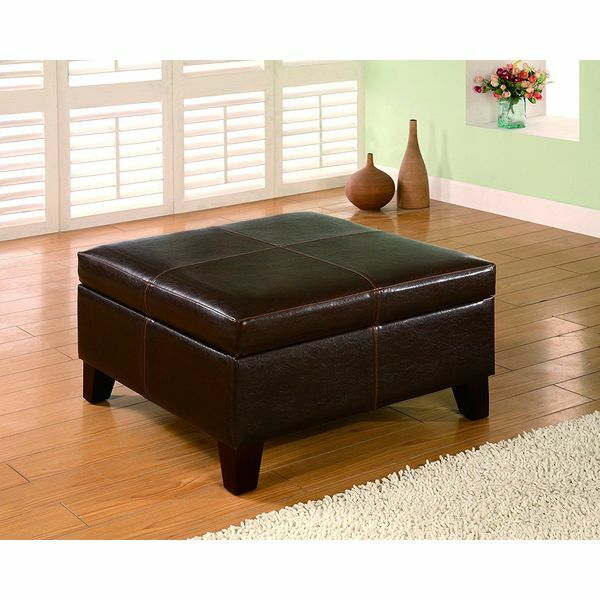 Now check out the Richmond Espresso Leather Storage Ottoman from Best Furniture. This multipurpose ottoman features a sturdy wood frame with a dark finish. The interior space is much larger than what you would think, giving you plenty of storage space. It features gas shock hinges to allow for smooth opening. Best Furniture will certainly not let you down. You will love this ottoman because of how easy it makes cleaning up after a party. Get yours today! Now lay your eyes upon this glorious square tufted storage Ottoman from Kinfine USA Incorporated. It features a tufted surface and plenty of storage for all of your items (though what else would you expect from a “storage ottoman”?). This comfy little ottoman will make relaxing after work that much more enjoyable when you prop your feet up on it, crack open a beer and watch some Jersey Shore. At such an affordable price, you might be tempted to buy more than one – heck, you might want to get one for every room in your home! Multi- functional storage ottoman that provides additional seating. Here is the list top storage bench from Home Elegance Furnishings. This ottoman is so big that it could probably seat 2 or even 3 adult sized people (or 6 cats, if that’s what you’re in to). It truly is a multi functional storage ottoman because it provides extra seating, flip top storage, and is an aesthetically pleasing piece of furniture. The dark brown faux leather does a great job of catching the eye. Do yourself (and your standing visitors) a favor and get one! Dimensions: 43″L x 22″W x 18″H. 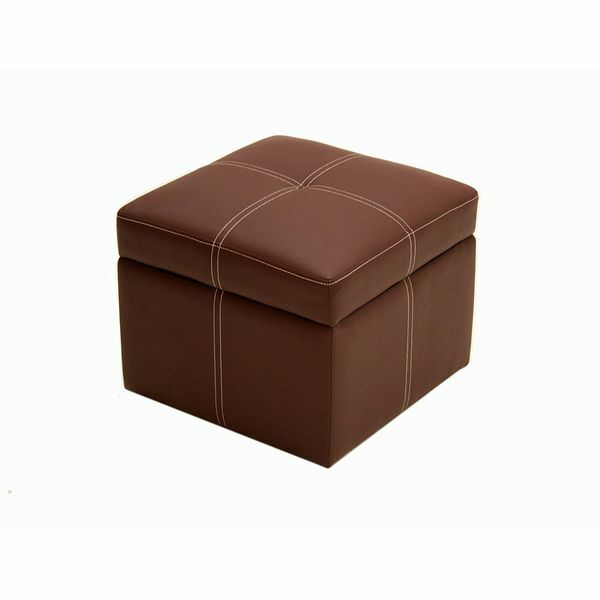 Here is the Rush Cube Mocha Storage Ottoman from Seville Classics. This is a great hand-woven storage Ottoman that you can put things inside very easily. The inside is lined with a mocha colored liner. The style of this particular leather storage Ottoman can sit most furniture settings. The cushion is tailored around a solid wood frame and can support up to 200 pounds seating capacity. We really like the style of this particular leather ottoman. 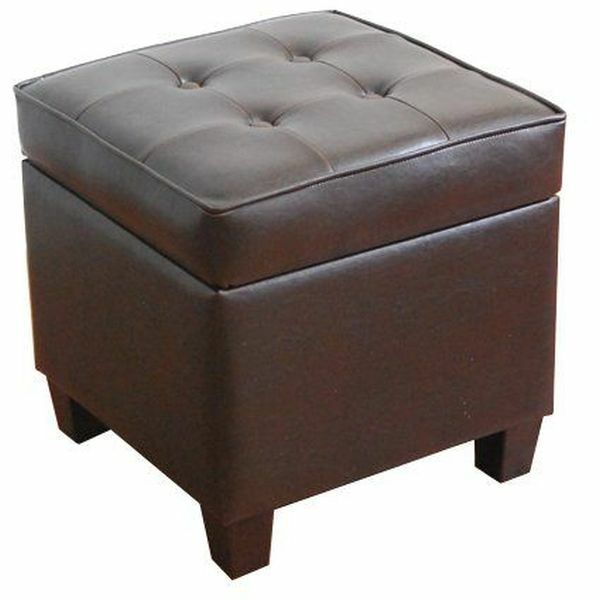 The Delaney Small Square Leather Storage Ottoman from Dorel Home Products is a very versatile piece of furniture. It features a contemporary design with contrast stitching, functional storage compartment, and a very comfortable cushion. These go out of stock quickly so get one soon before they’re gone forever.